The Day I Lost My Child & What We Did To Prepare For It…. I know what you are thinking. What the heck kind of post is this. The title is super deep. And yes the subject matter is super deep. Last year I began to write all about the day I lost my son and then something stopped me. I was a brand new blogger, I was scared of all the judgement, the comments, the un-follows etc. But I always felt deep in my heart that this was a story that I had to share. I’ve always thought that if I could share my stories on my blog and if they helped just one person in some way then they are worth any negative repercussions that come my way. Because of all of your support from my Living With Anxiety post,I feel empowered to tell this story. So now that I am over my insecurities, I am ready to tell you the story of the day I lost my son. When I say lost, I mean LOST, as in I could not find my 9 year old son and he could not find me for over an hour in a really super crowded, scary and enormous place. Do you recall the post I did on our trip to San Antonio last year, the one titled: San Antonio Waterparks, Riverwalk, Tarheels and Tantrums ? It was a generally fun and uneventful trip. It was well planned, including our trip to Sea World’s new water park Atlantis. As always we had looked at the map of the water park, pre-purchased tickets and learned all about the rides so we were all set to go the next day. That is until we got online to look up the opening hours only to discover they were closed for the rest of our trip. UNBELIEVABLE! We promised the kids a water park and we wanted to deliver. 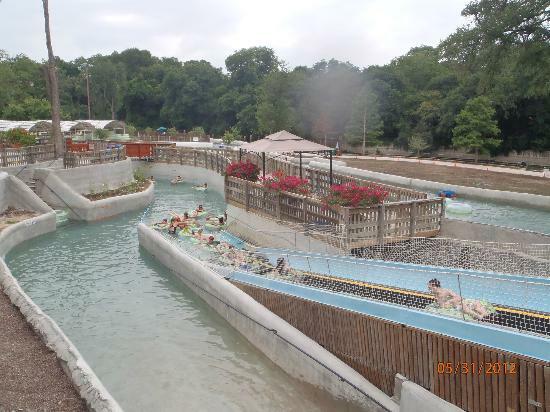 My husband quickly found another waterpark close to San Antonio called Schlitterbahn in New Braunsfel, Texas. It is actually one of the top water parks in the world. We were all excited to have found alternative plans however it was late and we hadn’t had time to do our due diligence and research all the rides and the maps as we usually do. Schlitterbahn waterpark was absolutely amazing. Probably the best water park I’ve ever been to. It’s actually two parks in one. An older section and a newer section.We rented a locker to store our cellphone and towels in at the old side of the park and began our day of “fun”. After driving all the way out there and spending about an hour and a half in the old section of the park Jude was done. I mean absolutely un-interested in everything there. My husband decided to take him all the way back to the hotel and come back to get Gavin and I around 5:30 PM. I had no idea you that it is the longest water ride in the world? Now take a look at this little beauty below the Aquaveyor? Yes, well this is where it all happened. The entire ride Gavin and I struggled to hold on to each other and not get separated . Several times we did and he would be several feet ahead of me. But this is when it turned bad. Gavin got sucked down a rapid to the left of this thing and I got sucked up the Aquaveyor. Yep, that’s right. At this point I was thinking ok, no big deal, I’ll get over the hill and he will be right there waiting. NOPE, No WHERE in Sight. ANYWHERE. Another issue with “The Falls” is that after this point in the ride there are constant exit points. When I saw that I started really getting worried. I assumed you got off where you got on. I thought that we would find each other at the end and everything would be fine but when I saw 1, 2, 3, 4, 5,6 exit points my mind started racing and I started paddling. People were laughing at me. Pointing at me and making fun of me for trying to paddle out of the ride. I didn’t get off at an exit point because I was afraid he was still on the ride. Finally, after about 15 minutes on the ride I got to the end and thought I would see him standing at the entrance/exit waiting for me. He wasn’t there. Did I pass him? Did the ride have two different paths? Did he get off at another exit point and he’s sitting somewhere there? So I waited a few minutes at the exit and then I immediately found two employees. I told them exactly what he was wearing and what happened. They didn’t seem too worried they acted like this happens all the time. But here were my worries…. At the entrance of the ride is exactly where bus loads of people are dropped off and picked up to be transported between the old and new side of the park (remember our locker was on the old side). And when I say side, I mean you are driven through a town from one park to another. Did he get on the bus thinking I went back to look for him? The ride we were on was right there next to a huge parking lot, an easy exit for a kidnapper to swoop him up and take him. Lastly the park was huge and he could be anywhere including on the ride still…you have the option of staying on continuously. Like as in…as long as you want. Was he still on there? I reported to them exactly what he looked like and told them I was going to walk up the side of the ride and check all the exit points. At this point I knew I wasn’t going to find him by myself. That is not a good feeling but deep in my heart I was not freaking out. I went back to the employees and asked the hardest question I’ve ever had to ask, “Where do you report lost children?’ They directed me to the locker rooms at this side of the park. I then had to fill out a piece of paper which was really weird, kind of like if I lost my wallet of purse. I was thinking this is my kid send out the police squad, stop the rides, the buses, close the gates. Everyone else didn’t seem to think the same way as I did. Now although I had a sense of urgency because all I wanted was to be back with my son, I still had that feeling of peace that he was ok. Within seconds of filling out the paper of his description a police officer that works at the park walked up to me and said are you missing you child and I confirmed that I was. He said “We have him.” You’ll have to ride with me because he’s at the top of the park. After about a 2 minute ride to the top of the park (and yes we were still on the same side) we got to the locker room. As soon as I saw him he started crying, he was very upset, of course. I told him how proud I was of him and he did everything right! He asked if we could ride just one more ride. I said yes but as long as it’s one where we are sitting on the same raft. We then got back on the bus and raced back to our locker, got our stuff and met Jude and my husband at the front gate. That is a day Gavin and I will never forget. Gavin knew exactly what to do when he was separated from me but it was not out of instinct and not out of luck. He knew because I have prepared him for this day since age 3. I’ve prepared him for other situations as well but for now I’ll talk about kidnapping/getting lost. Some may disagree with me but I have always felt that appropriate information given at the right age is extremely important to keep children safe. I have never just put everything out there at once but I slowly educate my children as they are able to handle the information. My goal is not to scare them or make them overly anxious but instead prepared. From a young age always teach your children to stay within a safe distance of you when you are out in public places including the park. Start explaining to them why. They need to know that not everyone in the world is nice nor do they have good intentions. Don’t sugar coat it but only tell your children as much as they can handle and in small doses. As they get older you can explain in more detail. Teach them to start trusting that inner voice. If they tell you “Mommy/Daddy that Man/Woman made me feel weird by the way they looked at me.” Address It. Talk to them about it. This has happened to Gavin before. We both got an awful feeling by a person who was scoping Gavin in public. Gavin talked to me about and I think his instinct was right on. Teach them what to do if someone tries to grab them. Get on the ground kick, spin, roll and scream. Have you ever tried to pick up a toddler throwing a temper tantrum? Try picking up a ten year old throwing one? It works. Prepare them for the day you get separated. It may happen like it did to us when you least expect it, when your cell phones are locked in a locker a mile away. Teach them to go tell an adult that works at the facility you are at …immediately! Don’t wait, don’t look around for Mom or Dad. Don’t go to another ride or hide in the bathroom. Make sure they know… I can’t find Mom/Dad, I’m worried, I need to tell someone NOW! Remember it only takes a second for someone to kidnap a child. Don’t just go over this information once. This information needs to be a constant reminder and adjusted with age and developmental appropriateness. You defiantly wouldn’t go in to the same detail with a 3 year old as with a 10 year old. Please remember losing your child can happen to anyone at anytime. Keep calm and level headed but act fast. About 6 months after my incident with Gavin we were at an extremely busy park and a woman and her older son were yelling for her young child and searching for him in a panic. To my surprise no one was helping her or asking her if she needed help. I gave my two kids to my husband and approached her. I immediately asked her details of what he was wearing, what his name was, what he looked like and started searching with her. Luckily we found him pretty quickly. But this is what I am talking about, be proactive and act fast. If someone needs help looking for a lost child, act immediately, don’t let that child become a statistic. Remember everything you teach your child is preparing them for what life throws at them and you never know what that may be….or when that may happen. Although I hate this happened to Gavin I know he’s stronger and a more confident young man. He’s growing wiser everyday and one day he will brave this big world without me, with great confidence and strength. Please feel free to share any of your experiences in the comments below. age appropriate preparation is so important! Great post! I need to have this conversation again with both our girls. Thanks for the reminder. Awesome article; harrowing experience that none of us ever want to go through but if it happens, to have it happen this way! One thing I would add, that we’ve taught our kids, is if someone does grab them add yelling ‘this is not my mom or dad’ into the mix of the temper tantrum. You see many parents escorting kids have meltdowns out of crowded businesses; adding this line, loudly, could bring attention to the fact that this is possibly an abduction, not just a meltdown needing to be addressed outside. Thank you for sharing! Melissa, Great point. I even thought of the screaming your not my Mom or Dad but forgot to write it. Thanks again! for this has never raised children. My 8 year old ran out into the street when she was 5 and got hit by a Ford F150. UNDER MY WATCH. I turned my back for a second. She knew she wasn’t supposed to go even near the street. I agree, preparation is best. And frequent reminders are crucial. And forgiveness of yourself is important. Thanks Bonda, and it is incredible how fast anything can happen even when you are right there. I’ve had near close calls with other things and then another event that just happened to Jude recently that I will write about soon. Many things have been completely out of my control so I really didn’t harbor a lot of guilt but a few I had a really hard time forgiving myself. That’s something I will definitely hit upon in the post I will write about with Jude and what happened with him. I am so glad that your daughter survived and everything turned out ok. Thanks so much for your comment. Wow! This post was scary but so so smart. I need to do a better job of this with my 3-year-old. I’m so glad your story had a happy ending! We had something similar happen at Sesame Place in PA three years ago. I was 7 months pregnant, with my then 2 and 4 year old kids and husband. My 4 year old little wildman got “Hot” and wandered away to get a drink. Didn’t tell us and we were down in a climbing area. Lots of supervision, yet he just walked away. Luckily I was there with many bloggers on a press day and one of them found him 10 minutes later. So scary. Needless to say, anywhere we go I keep a tight rein on him. He’s 7.5 now and gets it somewhat now. Your tips were great and while we’ve taught him most of that, I agree, you need to have a plan in place, just in case. I’m so glad the outcome was good. I think I should add for little ones that adding those tattoos with parents names and cell number would also be a great idea for parks. Especially for kids who run or wonder off. Jude has a tendency to do that. He refuses to hold hands, we look like we are abusing him when we are crossing the street and he is so heavy to carry. I witnessed a little girl getting returned to her mom by a Disney employee this week. She was about 5 or 6 and was able to tell the employee her mom’s name and shirt color. It seems that she went straight to an employee as Gavin did. Jude my 3 year old is gonna be a little harder to convince that staying with us is important he already is pushing the limits which Gavin never did. Thanks Carrie, I’ll have to check that book out. I try but by no means am I a perfect mommy. Our younger one is much more challenging when it comes to understanding the dangers of the world. Not just meaning strangers. He runs from us, out of stores, in to the street and so on. It’s very frustrating but we just keep persisting and staying consistent. This was such a great post. I found it via Pinterest and this is something I need to be more diligent about with my kids. We don’t talk so much about strangers and we do about “tricky people.” I will definitely start talking to them more about the “plan” maybe starting with places like the grocery store and the farmers market. Thanks again! Phew. Thank goodness. The last time I was at Disney World there was a little child with Disney employees and they too were following their protocol. I didn’t realize that they have employees dedicated to that task but I’m so glad to hear it. Even more importantly it literally can take seconds for a child to get separated, like you said. And none of us ever think it will happen to us. I sometimes think when a child is around multiple adults it happens even more. Every adult typically thinks the other adult is watching and then the child may slip away. So So So glad that everything ended well for your family. So proud of you for training your child with what to do. So many parents don’t. I grew up a military brat living all over the world. It was not unusual to be in a foreign place with no one that spoke English. My parents always instructed us to go to the last place we remembered seeing that and to stay put and they would come find us. It worked more than once. We have also taught our children the same. They are to find a mom, or a police officer but not other uniformed people (not all in uniforms are helpers)and let them know they need help. They also know to see if this person they have asked for help will just stand with them until their father or I have re-traced our steps to him or her. We haven’t had to use it, but it is something we discuss any time we go to a crowded place. Thank you for sharing with all of us. I am so grateful your reunion was a happy one! Jennifer, Thank you! And yes I am glad it ended well. And you are right that not all “uniformed” people can be trusted. It’s a whole learning/ teaching process. Awesome post Lesley! I haven’t experienced anything like this and hope I never have to. How scary!! My son is 2 now and I’m going to start teaching him practical life safety procedures soon. It’s so important to start early in cases like these!! Thanks I am so glad others can take away something from what was a very scary and serious event.